This is a vintage Italian musical jewellery box, dating to the 1970s/80s. It plays the beautiful Italian love song tune, Torna a Sorrento (Torna a Surriento). Details of this are further on in the description. 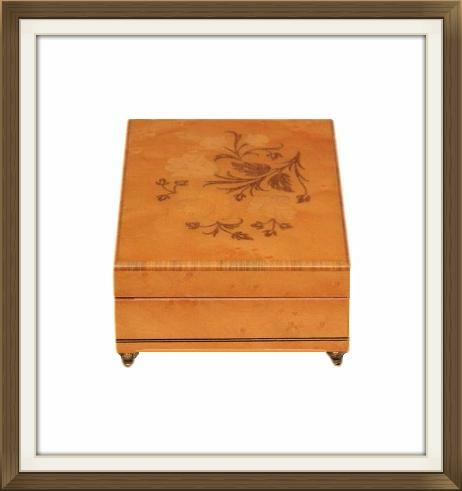 The box is made of Satinwood and has beautiful inlaid decoration to the lid. The wood has been polished to a high gloss finish and has a very beautiful shimmer. 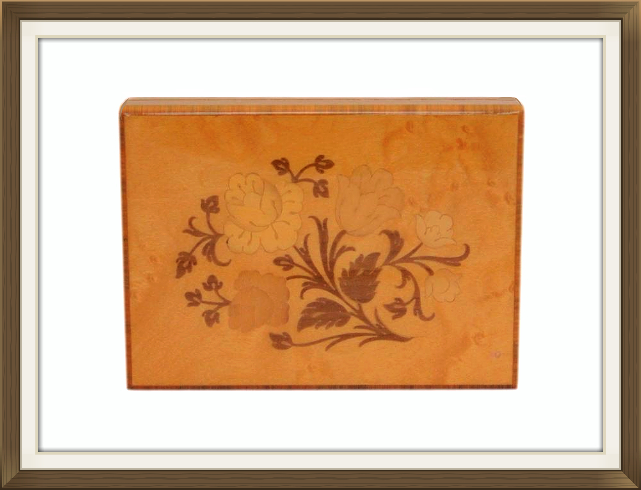 The inlay has a beautiful floral design and is made up of several varieties of wood. There is also beautiful inlay around the edges of the lid, made up of fine bands of various woods. The box stands raised on nicely shaped, gold metal feet. 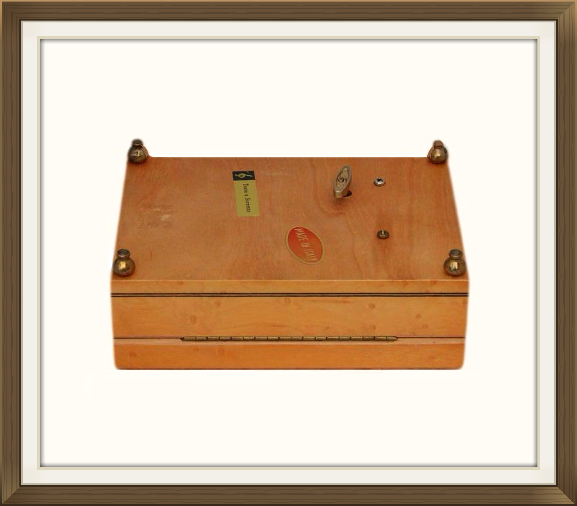 Its original Made In Italy and tune title labels, are still on the base of the box. The interior has a single compartment, lined with beautiful deep red velvet. The musical movement has a velvet covered casing, and is positioned to the right of the compartment. There is enough space above this for placing little pieces of jewellery, such as rings and hoop/stud earrings. The compartment will hold slightly larger pieces of jewellery, such as brooches, pendants, chains and small linked bracelets. The lid has a polished, gold metal stop hinge, which prevents it from falling backwards. This is a Neapolitan song, said to have been composed by Ernesto De Curtis in 1902. Translated, Torna a Sorrento, means 'Come Back To Sorrento'. Torna a Sorrento became extremely popular and has been performed by numerous artists such as Dean Martin, Elvis Presley, Placido Domingo and Luciano Pavarotti, to name just a few! The song was re-arranged and had a new set of lyrics, to produce the famous Elvis song 'Surrender'. 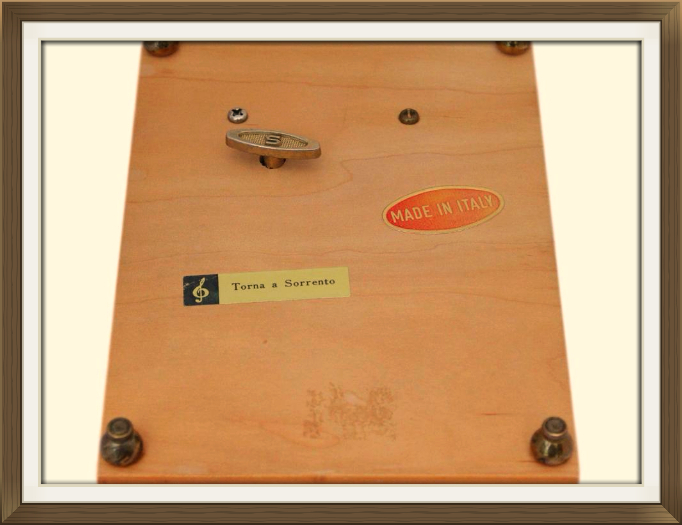 The tune is operated via a key on the base of the box. 3 & 1/2 turns of the key are sufficient to wind up the musical movement. The music stops as it should, when the lid is closed or when the movement is fully unwound. As with all musical boxes, care should be taken not to over wind the key. The casing to the movement can be removed, should the movement ever require attention. It is presently in excellent working order with the music playing at the correct speed. 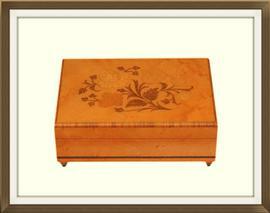 This wonderful box is in superb condition for its 30 to 40 years of age. It is structurally sound and has no knocks or nasty scratches. The velvet linings are in beautiful condition with just a few superficial light marks. It appears that the box has seldom been used. Please use the following measurements to ensure the box is the right size for your requirements. 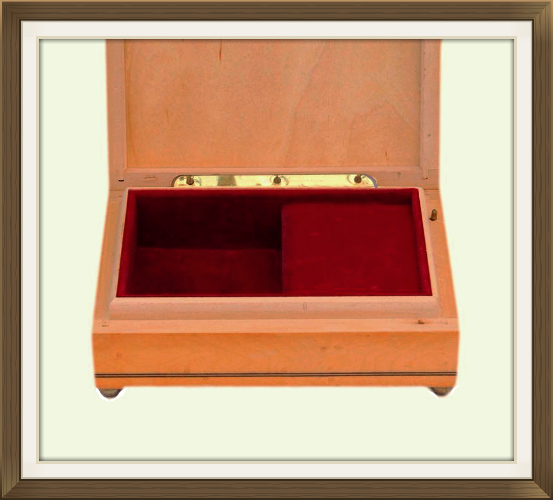 It is a lovely little box which is ideal for a small collection of jewellery. 8.0 by 6.5cm with a 3.0cm depth. 7.7 by 5.5cm with a 0.8mm depth.